Of our ten acres, five are forest, land that flies on its own woodsy autopilot. The other five are a meadow left over from the original farm’s fields, and these require more attention. The question is what kind of attention. Our immediate predecessors viewed this expanse as a huge, rolling lawn and mowed it from May through October, a task that apparently kept Paul in the seat of his Husqvarna for many hours day after day. 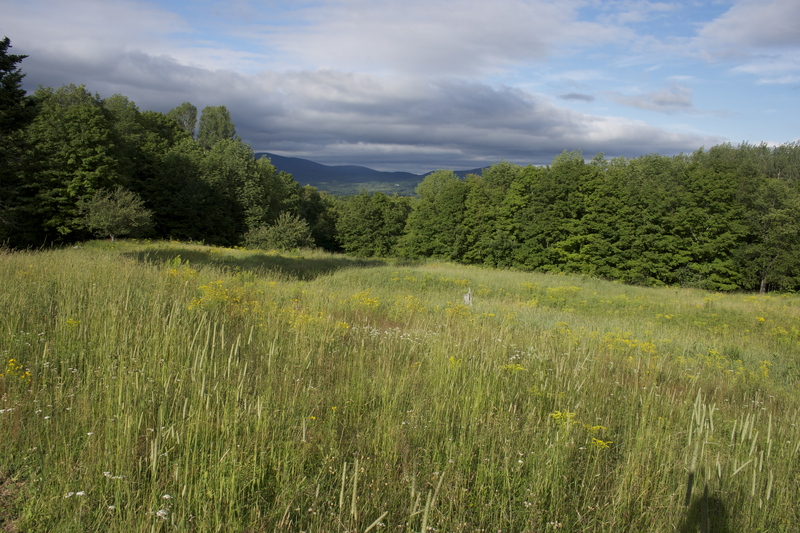 Early on during our ownership, Edith and I decide that we will mow only a half-acre surrounding the house; the rest of the meadow we will let grow wild. So far so good: less work, less use of fuel, more ecological variety, and a bigger habitat for wildlife. Yet even meadows need occasional grooming. Neighbors warn us early on that if we don’t mow once a year, saplings will spring up, trees will grow, and our open land will gradually revert to forest. During our first autumn on Hyland Hill we hire Jeff Moran, a local contractor, to “bush hog” the hillside. This task involves a tractor towing an agricultural mower. The cost: $300. The result: grass, weeds, saplings, and wildflowers laid low. The following summer, my brother-in-law Geoff spots a rusty old scythe hanging in the front shed—one of many tools that Doris and Paul left us when they moved out. “That’s an American scythe,” Geoff tells me, and he points out the dull blade and the ungainly aluminum handle (which I later learn is called a snath). Geoff goes on to say: “Someone told me that these American scythes are almost useless. They’re heavy and tiring to use, and the blades aren’t very sharp. The good ones are Austrian—lighter and much sharper.” These comments catch my attention but prompt no action at the time. A few weeks later, though, an article about scythes appears in—of all places—The Wall Street Journal. Titled “Who Needs a WeedWacker When You Can Use a Scythe?”, this piece describes the ancient tool and its contemporary renaissance. “While Americans persist in cutting grass with labor-saving devices,” Journal author Barry Newman writes, “faithful scythers believe their old tool has plenty of life left in it. U.S. scythe sales are nearing 10,000 a year now. . . . Predictably, scythe buyers are small, green farmers; unpredictably, they are also city folk and suburbanites.”  Intrigued, I visit the Web site for the Marugg Company, a Tennessee-based husband-and-wife enterprise that Newman has mentioned in his article. The Marugg Company, founded by Swiss immigrants in 1873, is one of three main American sources for scythes. [URL: www.themaruggcompany.com.] A helpful conversation with one of the owners, Amy Wilson, leads to my ordering the first of two scythes that Edith and I purchase that summer. On receiving my order a week later, I try out the tool in our meadow. I am instantly hooked. Edith is skeptical at first but soon catches the same bug. Over the next few months we hone our skills as well as the blades. The scythe is essentially a scimitar on a stick. Excepting the chain saw and the axe, no tool I’ve used seems more dangerous. It has a dark reputation, too, since most people know the scythe only as the Grim Reaper’s harvest implement. The bad rep is unfortunate. Just about any tool is dangerous if misused. Surely the most lethal device in our midst is the most utilized, most beloved, and most romanticized: the auto. (Given the statistics on how we die in the modern era, the up-to-date icon for Death should be the Grim Driver: a skeleton behind the wheel of an SUV.) So, yes, the scythe is dangerous. But its nature, its modus, and its consequences aren’t negative; on the contrary, civilization almost literally sprang from its blade. With a pedigree dating back to the pre-Neolithic sickle, the scythe made agriculture so much more efficient that it transformed the pre-industrial world from the Fertile Crescent outward. 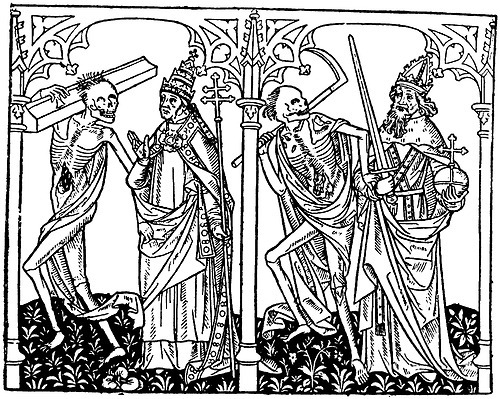 Never mind the Grim Reaper’s ghastly harvest; the scythe in human hands was the giver of life. Something else is positive about the scythe. Unlike the chain saw, the SkilSaw, the Sawzall, the WeedWacker, the hedge trimmer, the push mower, the ride-on mower, the leaf blower, the snow thrower, and all the other strident gas- and electric-powered machines that have replaced so many traditional hand tools, the scythe needs no fuel and makes no awful noise. It has an ancient, venerable feel to it, and not just because this implement is nearly silent. The scythe runs on human energy and certainly requires some effort, but it’s surprisingly easy to use and repays the user with satisfaction and wellbeing. Now, having acquired our scythes, Edith and I have to learn to use them. There’s no one around to train us—no relatives or neighbors to demonstrate the basics, as would have been true throughout much of the world over the past two thousand years, or to coach us as a refine our skills. 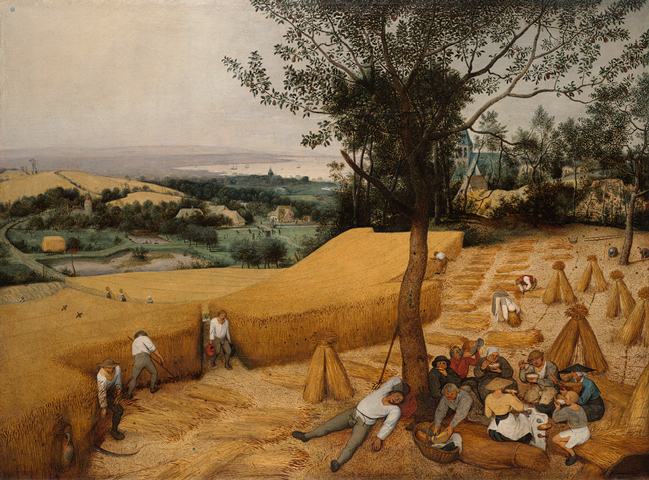 Paintings from the medieval and renaissance eras show men, women, and children working together in the fields; knowledge of using these tools must have been almost universal. But we have no elders, siblings, or neighbors to show us the way. How are we going to learn? Typical for us, our first recourse is to buy some books. The best of the lot is David Tresemer’s The Scythe Book: Mowing Hay, Cutting Weeds, and Harvesting Small Grains with Hand Tools. This manual provides exactly what the title and subtitle promise—the information that anyone needs to use a scythe. Particularly helpful are several chapters on the proper technique for mowing. Tresemer is reassuring from the start. “Mowing should be comfortable, not too strenuous, not . . . tiring. If it is exhausting, it is wrongly done. . . . At its best, the stroke does not have to be stopped. It is initiated with just enough energy that the last of the grass is cut and thrown to the windrow [that is, the row of mowed-down stalks] as the momentum of the stroke is reduced to zero; the leftover energy is comfortably stored in the tendons to power the recovery back to the right.” But instructions like these, even if relatively precise, can be difficult to translate into action. Soon I resort to the best bad way to learn something: watching YouTube videos. I’m not surprised that scything videos exist on the Web, but the number and variety is bizarre. Options include “Scything,” “Scything with Susan,” “Lawn Scything,” “Scything and Wind-rowing Hay in Scotland,” “West Country Scythe Festival 2010,” “Polish Peat Bog Scything Competition . . . “ The list goes on and on. Typical of YouTube, many of these clips are goofy—the scything equivalent of cute-cat videos. Some, though, are useful. “How to Scythe,” for instance, demonstrates and describes basic technique so well that I acquire my first really effective “feel” for the tool. “Scything and Wind-rowing Our Hay in Scotland” helps me refine my stance and stroke (and, while I’m at it, my Scottish brogue as well). And “Martin Kebblewhite Teaching Scything” presents a seventy-something expert’s useful tips on multiple issues. 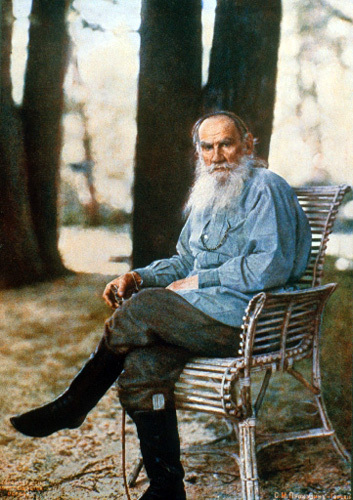 Leo Tolstoy as photographed by Sergey Prokudin-Gorsky, 1908. After lunch Levin was not in the same place in the string of mowers as before, but stood between the old man who had accosted him jocosely, and now invited him to be his neighbor, and a young peasant, who had only been married in the autumn, and who was mowing this summer for the first time. The old man, holding himself erect, moved in front, with his feet turned out, taking long, regular strides, and with a precise and regular action which seemed to cost him no more effort than swinging one’s arms in walking, as though it were in play, he laid down the high, even row of grass. It was as though it were not he but the sharp scythe of itself swishing through the juicy grass. Behind Levin came the lad Mishka. His pretty, boyish face, with a twist of fresh grass bound round his hair, was all working with effort; but whenever anyone looked at him he smiled. He would clearly have died sooner than own it was hard work for him. Somehow Levin reaches a compromise between these two states of skill and grace; and as the work proceeds, he manages to attain a rhythm that makes the work easy and almost automatic. Levin kept between them. In the very heat of the day the mowing did not seem such hard work to him. The perspiration with which he was drenched cooled him, while the sun, that burned his back, his head, and his arms, bare to the elbow, gave a vigor and dogged energy to his labor; and more and more often now came those moments of unconsciousness, when it was possible not to think what one was doing. The scythe cut of itself. These were happy moments. . . . The longer Levin mowed, the oftener he felt the moments of unconsciousness in which it seemed not his hands that swung the scythe, but the scythe mowing of itself, a body full of life and consciousness of its own, and as though by magic, without thinking of it, the work turned out regular and well-finished of itself. These were the most blissful moments. Arkadi A. Plastov, “Reaping” (1945). Source: see Note 5. The sun sank behind the forest. The dew was falling by now; the mowers were in the sun only on the hillside, but below, where a mist was rising, and on the opposite side, they mowed into the fresh, dewy shade. The work went rapidly. The grass cut with a juicy sound, and was at once laid in high, fragrant rows. The mowers from all sides, brought closer together in the short row, kept urging one another on to the sound of jingling dipper and clanging scythes, and the hiss of the whetstones sharpening them, and good-humored shouts. So there you have it. Wielding the scythe properly, you get a good full-body workout, a flow state, a bonding experience with your fellows, hours of sensory delight, and communion with nature. You get hay or wheat, too, while you’re at it. You aren’t grim at all as you reap, but rightly cheerful. The scythe is the bestower not of death but of life. Edith and I have no peasants toiling on our property, so we can’t partake of the communal experience that Levin enjoys in the fields. We are our own serfs. We enjoy the work, however, and we revel in collaborating on this task. 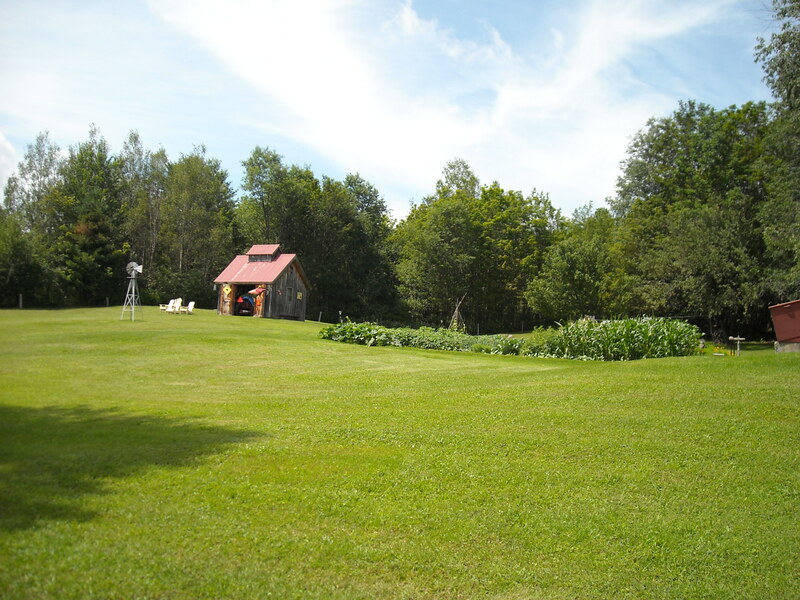 In September of that first year of scything, we hand-mow our entire meadow. We then wheel many barrows piled high with cut grass into our big vegetable garden to use as mulch. The rest of the hay lies mounded across the hillside where, once the heavy frosts arrive in October, the windrows look as white and as glittery as snowdrifts. All winter the old grass withers and deteriorates beneath the real snow—so much the better to nurture the new grass that will spring forth in April. Tolstoy, Leo. Anna Karenina (Richard Pevear and Larissa Volokhonsky, translators). New York: Penguin Classics, 2004. 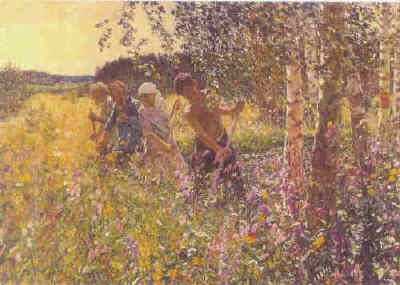 Arkadi A. Plastov, “Reaping” (1945). Source: http://www.hayinart.com/images/960.jpg. This entry was posted in Literary "Musements" and Amusements, Tools and Work by Ed @ Montemayor. Bookmark the permalink. Perhaps we can encourage the noisy landscape crews here in Maplewood to adopt this method? Yeah, ain’t it the truth! I’ve read that some county road crews are starting to use scythes . . . but suburbanites might freak out over the sight of men wielding gigantic blades.